“eSports brings people together and breaks barriers of age and region, often empowering and encouraging those who play it. 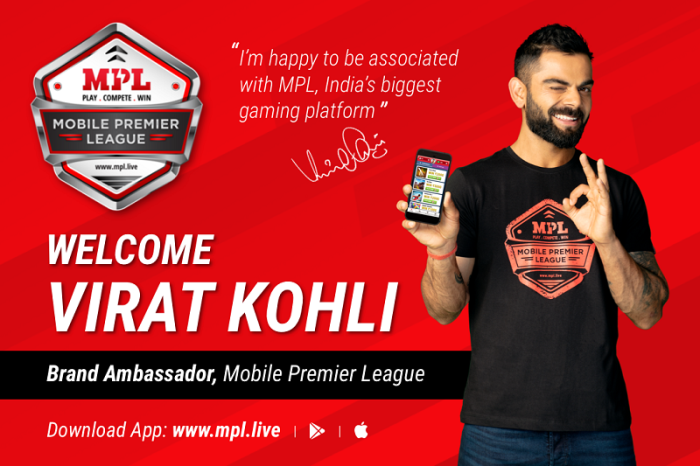 I am extremely happy to associate with an exciting young brand like MPL, that is making mobile eSports so accessible to Indians across the country,” said Virat Kohli, Captain, India Cricket Team. MPL (Mobile Premier League) is a holistic mobile gaming application, launched in September 2018. In the short span of time since it went live, the platform has garnered over millions of users, making it India’s fastest growing eSports Platform. MPL offers mobile gaming lovers, a one-stop-platform with multiple, popular, skill-based games to choose from. With its low entry-barrier and selection of multiple casual games, MPL ensures that even inexperienced and new users have the opportunity to compete and win rewards and participate in the many tournaments that the platform hosts. Users can download the app via the Google Play store, App store and MPL website.